The Methane SUP Paddle, by Kialoa has been inspired by the designs of surfboard shaper Blane "Methane" Chambers, became KIALOA's best selling SUP paddle after its release last year and is the surfers choice. Made with surfers in mind, the 8" wide blade is perfect for the quick starts, stops, and turns that come with trying to ride an SUP board in the ocean surf. Weighing in at only 21 ounces, the Methane SUP Paddle uses 100% carbon fiber construction to provide the ultimate ratio of strength to weight. Its featherweight design and construction encourages rapid cadence and a slick and quick paddle placement at all points of the SUP surfing experience. Often SUP surfers have to do quick movements with their paddles. Never has whipping the paddle to the opposite side of the paddleboard or behind you been so effortless. The unidirectional Ergo-T design provides superior blade control and fits easily and comfortably into the palm. KIALOA understands that scaling down the diameter of the shaft of the SUP paddle does not necessarily bring down strength, and utilizes this technique to create a more unique board. The blade's surface area is 97 square inches. A narrow blade with a small surface area makes quick acceleration through the surf more manageable, and also allows you to keep the blade close to your board as you stand up paddle, which accelerates forward propulsion and encourages straighter tracking. This SUP paddle's extensive product testing and lightweight framework resulted in its success and widespread use among today's stand up paddlers. 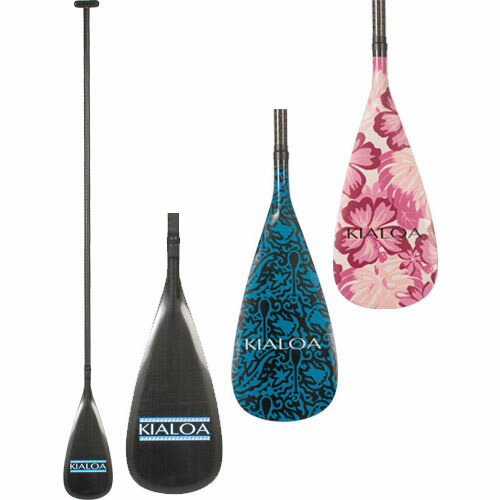 For the past 20 years, Kialoa Stand Up Paddles have been known for their top-of-the-line high performance paddles. 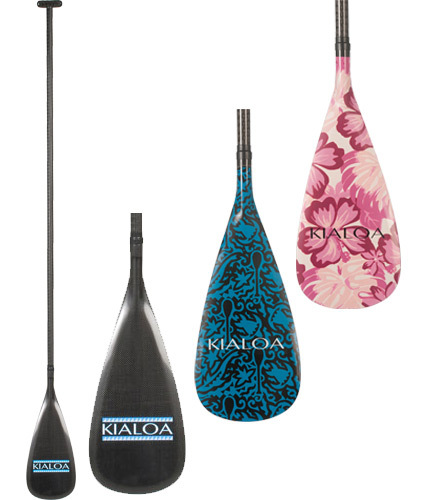 Kialoa's full carbon fiber SUP paddles are still the very best when one is looking for a paddle of the highest quality . Designed and engineered with the best ratio between toughness and weight, each paddle utilizes a carbon PowerARC blade design with a 10-degree bend, an ovalized tapered carbon shaft and a carbon Ergo-T. With each drag through the water the paddle feels clean, sharp, and saves energy because of it's stiff, strong body and narrow, light design.